Save money and get a unique look by sewing your own curtains - go on, you know you can do it. Hem the sides and bottom, stitch heading tape to the top, and you're done. This step-by-step guide shows you just how easy it is. Measure all the curtain lengths, marking them with pins or a pencil. On patterned fabric, choose one main point in the design and mark off each length starting at this point. Cut out all the lengths. If you need to join widths to make up each curtain, pin the fabric pieces together along the selvages (the finished edges of the fabric that won’t unravel) with right sides facing. If you have an odd number of fabric widths, cut the 'odd' piece in half lengthways and pin one half to the outside edge of each curtain. Stitch the pieces together, taking in a 2.5cm seam. Press the seams open and snip into the selvages at 45cm intervals so the seams won't pucker when the curtains are washed. Turn under a double 2.5cm hem at the curtain sides and press. 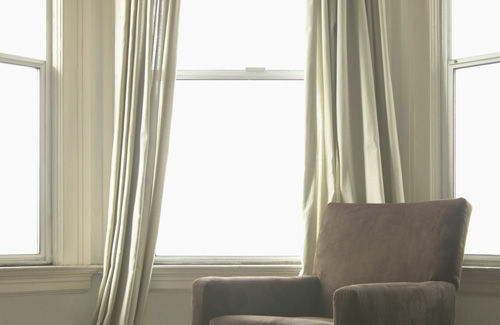 Use a large hem stitch to sew the curtain sides by hand. Temporarily hang the curtain by a few hooks and mark off the desired length with pins. Take down the curtain and turn up a double hem to the marked length and press. To make a neat finish at the lower corners, open out the folds at the sides (unpick the side hem you've already sewn), and the hem. Fold in the corner at an angle, then carefully refold all the turnings to make a 'mitred corner'. Hand-sew the hem and the mitre (you can use the machine if you’re in a hurry).